facts vs. law « Hercules and the umpire. Before it happened, you could not have convinced me that I would one day order a state (or anyone else) to pay $150 million or so based in significant part on one my sketches. But that is truly what happened. See Entergy Arkansas, Inc. v. Nebraska, 226 F.Supp.2d 1047 (D.Neb.,2002) (Nebraska breached its good faith obligation under the Central Interstate Low-Level Radioactive Waste Compact and must pay $151,408,240.37 for its violation of federal law), aff’d 358 F.3d 528 (8th Cir. ), petition for cert. dismissed, 542 U.S. 960 (2004). Plaintiffs claimed that Nebraska had breached its good faith obligation under an interstate compact when it refused to license a nuclear waste disposal site. The issues were complex. Over the span of a month or so as the trial proceeded, tons of scientific evidence was presented derived from computer models, hydrographs, well borings, core samples and physical observations. 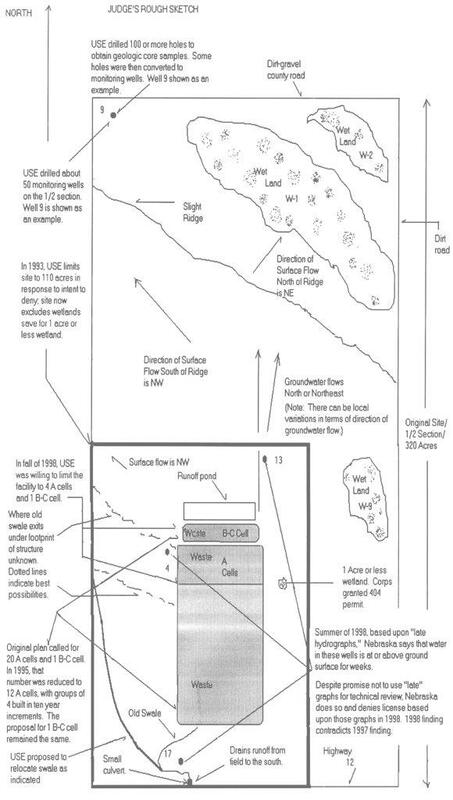 At issue were questions pertaining to ground and surface water flows, wetlands, the topography and geology of the site, radioactive release scenarios, and on and on and on. The evidence made my head spin. The day we arrived it was so hot and windy that we had to walk each of the 320 acres rather than taking a vehicle. A pickup’s exhaust might start a prairie fire. Since the license had been denied, no construction had taken place. It was difficult to envision how the completed project would look in relation to the topographical features of the half section of ground where the project was to be constructed. Thus, we really had to tramp all over the damnable place. During the walk-about, I tumbled down a slight ridge and into a culvert. The lawyers helped me up and tried hard not to laugh. I wasn’t hurt. However, I was covered with stickers and all manner of dust and dirt. After I picked the straw out of my hair and our tour ended, we returned to the plane. While we were in the air, I tried to compose some notes of what I had seen and how that site visit could be placed in context with the other evidence that I had heard. The inside of the plane was stifling and I was stumped. None of my notes made sense. We eventually reached an altitude where the temperature in the little twin-engine began to fall to something slightly under 80 degrees. As the temperature moderated, and almost without thinking, I began to sketch. By the time we landed, I was beginning to understand the true picture. Once the trial ended, and I began to draft my opinion, I sat down to carefully review my notes. What drew my attention again and again was the sketch I had started on the plane. I began to refine the sketch. The more I refined the sketch, the more the scientific issues and the case more generally came into focus. Entergy, 226 F.Supp.2d at 1092. So, what lesson is there to be learned from the foregoing about being a federal trial judge? It is pretty simple. Facts are the dominion of the trial judge whereas law belongs to appellate judges. It is up to the trial judge to understand the facts better than anyone and then portray them honestly. That effort sometimes requires getting a bouquet of burrs on your backside.